A graphic novel-focused blog affiliated with the Arapahoe Library District. Described by critics as A Game of Thrones meets Star Wars meets Romeo and Juliet Brian K. Vaughan's new series Saga tells a story of two lovers from warring factions who have brought a child into the world. They meet and overcome strangers and dangers in the unique fantasy/science fiction world in which they live. 1. Saga’s world can seem like a mishmash of sci-fi and fantasy elements what with the Godzilla monsters and TV headed men and wooden spaceships. Does it come together as a cohesive and thought out setting? 2. What is with the TV headed folks? Is there symbolism there or is it weird for the sake of weird? 3. 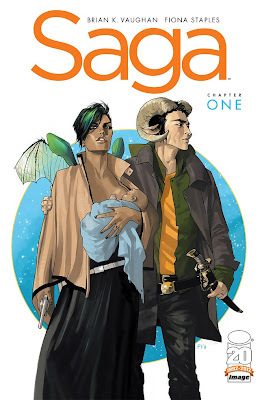 Saga is told from the perspective of Marko and Alana’s child who points out at the end of one chapter that she will be safe as long as she is with them. Doesn’t this remove the suspense of the story since you know they’ll turn out okay? Why? 4. One of the central conflicts of Saga is between the “horns” and the “wings.” Is Vaughan using this story as an anti-war and anti-racism mouthpiece or is there more to it? 5. Does this story deliver on the Star Wars meets Romeo and Juliet meets A Game of Thrones feel as early reviewers deemed it? 6. Narration has been considered an outdated storytelling technique in comics. Thought bubbles and narration hearken back to the days of bad 90s X-Men comics. How does Vaughan do with narration in Saga? 7. What is the significance of the cursive written narration in their juxtaposition with pretty images? 8. Vaughan chose to publish with Image because he can own the rights to Saga’s story and never have it turned into a film or TV show or anything. Do you agree with his thoughts that this story should say within comics pages? What does this communicate about Y the Last Man’s struggles with film? 9. What do you predict The Will might do in future issues? Team up with Marko and Alana? Hunt them mercilessly in a game of (lying) cat and mouse? Welcome! This to be a resource for the Adult Graphic Novel Book Club at Koelbel library with selections, dates, and discussion questions. Any and all are welcomed to discuss and comment on the latest graphic novel book club news or graphic novels in general. All graphic novel book clubs meet the second Thursday of the month at Koelbel Library from 7:00 to 9:00 p.m. For more information, including directions and other library book clubs and programs, click here. Do you want to get our obscure references and the (mostly lame) inside jokes we make at our book club? Here's what we've read in the past.